This initiative to promote Lung Cancer Awareness Month has been made possible by a unique collaboration of lung cancer advocacy and research organizations to bring awareness to the public about the recent progress in lung cancer research. Please order your items below and a purchase order form for payment will be emailed to you. Please click on the images below to see each item in more detail. This collaboration has been generously supported by several corporate partners. 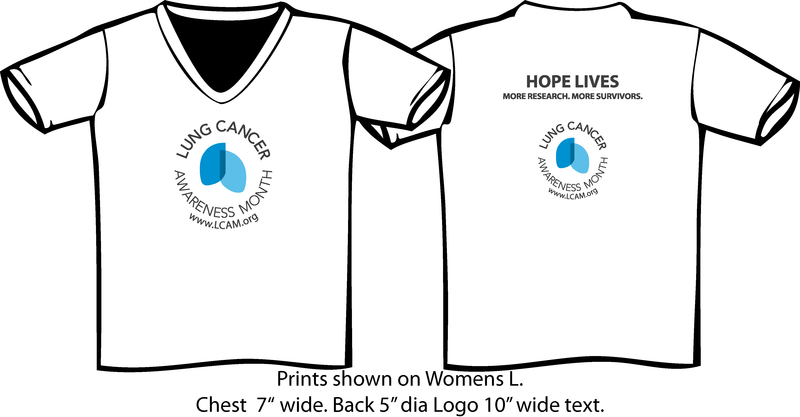 Please browse the items available below and to support research in lung cancer and to spread hope about how these advances are saving lives. Please note that all items below are being sold at cost and shipping is free. If you Shared Your Story on our website, we will send you a t-shirt, pin and bracelet for free - please just indicate your size below and add additional items if you wish to purchase them. We hope you will use any savings to donate to lung cancer research this November. To visit the partner websites, please visit: Lung Cancer Awareness Month Partners page. If you wish to purchase larger quantities than are displayed below, please contact membership@iaslc.org. Did you share your story and photos on www.LCAM.org?